Tilted Horizons: Lee Parks DeerTours Glove Give-Away! 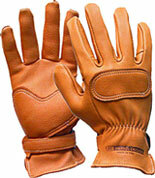 Lee Parks DeerTours Glove Give-Away! This is the first in a series to help rid the Tilted Horizons gear closet and garage of excess gear and accessories. First up: a pair of new, never-worn, size medium, tan DeerTours gloves from Lee Parks Designs. DeerTours are buttery-soft deer skin with minimal seams and excellent control feel. They wear like iron and are washable (instructions are on Lee Parks' website). I've owned a pair for about 7 years; they're my "go to" gloves when the going gets hot. For a change to win these gloves (currently selling for $84.95) and have them shipped to you free, click on Profile and send me an email with the answer to this trivia question: What is the year, make and model of Doug Just Doug's current motorcycle? (It's an open book, or rather open blog, test). The winner will be chosen in a random drawing among all entries received no later than midnight EST April 30, 2011. (Shipping will be only to addresses within the continental USA). Good luck, and should the mood strike be sure to visit some of the advertisers at the top of this page.